With over 14 years experience, Katie Nilan has become the foot and ankle specialist families can trust by providing best practice podiatry care on the Lower North Shore and in the suburbs of Neutral Bay, Cremorne and Mosman. Katie Nilan Podiatry specialises in the assessment, treatment, rehabilitation and management of all foot, ankle and lower limbs disorders. This includes all skin and nail conditions, bone and joint disorders, soft tissue and muscular pathology, and neurological and circulatory disease. With a keen interest in runners, Katie specialises in heel pain (including plantar fasciitis), soft tissue injuries, forefoot pain and growth plate injuries seen in children and adolescents. 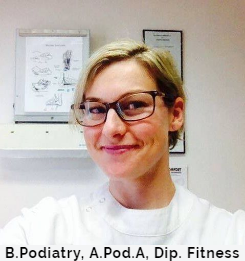 As part of her performance based podiatry care, Katie provides corrective exercise rehabilitation, biomechanical correction, footwear and orthotic management. Currently completing postgraduate university studies in Diabetes Education and Management, Katie Nilan is passionate about keeping up to date with the latest research and techniques to help maximise patient’s enjoyment in their chosen hobby and improve their quality of life. Working under the tutelage of a podiatric surgeon for 4 years, Katie is well sound on the latest surgical techniques. To further compliment her studies, Katie has completed post graduate training in injection therapy technique at the Centre for Podiatric Surgery and Medicine. Katie is a specialist footwear provider with Ascent Footwear and has also contributed an article to the Australian Women’s Health Magazine. Katie’s services are Department of Veterans’ Affairs (DVA) and workers compensation approved. Katie Nilan Podiatry are members of the Australian Podiatry Association (NSW), Sports Medicine Australia (SMA), Australian Diabetes Educators Association, and Exercise & Sports Science Australia (ESSA). Katie was honoured to accept the award for "Pride of Professionalism & Services towards the Community” by the Rotary Club of Sydney and featured in the “50 Faces of Northern Beaches” for recognition of Outstanding Service in the Community.